Officially opened for business in 1937, the Cave Supper Club quickly became one of the biggest night life hot spots in Vancouver history. The club was an endeavour taken on by Gordon King and his family, who were creating a sister club to the already standing Cave in Winnipeg where the Kings originated. What originally made the Cave stand out from all other Vancouver night life attractions was its kitschy, over the top atmosphere. The two level club had the license to seat 600 party goers (though on popular nights it was not uncommon to find over 1,000 bodies taking in the night) and often patrons had to dress to the nines and suffered excruciating lines just to step inside. Part of the charm of the Cave was its literal interpretation of its namesake. The club sported raw stone-like walls creeping around the carved out spaces, and enormous dripping stalactites falling from the ceilings, all hand crafted out of burlap sacks and Paper Mache via the King’s skillful hands. The atmosphere was heightened with dim lighting and khaki green walls. They even went as far to create giant palm trees (opposing popular belief the Kings assumed this tropical flora grew in underground rock caverns) which surrounded the ground floor of the club. 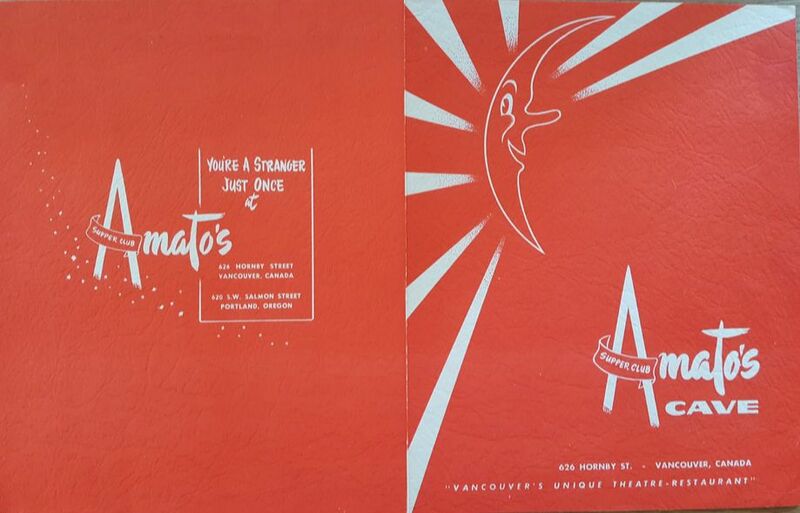 The club was a space of quirky and eccentric indulgence, and Vancouverites ate it up with a spoon. The space was so constantly popular owners were hard-pressed to find opportunities to close for renovations. Most would agree however that the dust and dilapidation that came along with this neglect only accentuated the famous glitzy grunge atmosphere. After its creation, Gordon King and his family moved on to other projects, and management changed hands to George Amato, an entrepreneur from Portland, Oregon, who quickly passed the club off to Isy Walters. In 1956 after managing the club for 6 years, Isy decided to pursue the creation of his own nightclubs and passed the Cave along to Ken Stauffer and his nephew Bob Mitten. The Uncle and Nephew duo then managed the club till its closure, constantly having to compete with Isy and his new venues, the Pacific National Exhibition and Isy’s Supper Club. Isy was the true innovator of the Cave Supper Club, and during his management pushed boundaries for Vancouver venues. In 1954 the Cave Supper Club was a part of the first wave of businesses to gain dining-lounge liquor licences, legalizing the sale of liquor to accompany meals served from 6:00 pm to 1:00 am. These new venues and spaces allowing the consumption of moderate amounts of liquor in public were all a part of the changing tides from traditional to more liberal social spaces. Following the liquor, Isy brought in the ladies. Soon the Cave had a slew of showgirls and dancers to complete the Las Vegas type atmosphere. The Cave Supper club was one of the Grade A west end clubs that offered live music, food, drink, and entertainment. It was considered classier than the other clubs emerging out of China Town, Main Street, and the East End, and was soon a hot spot for international acts that were beginning to favour the Vancouver scene. Perhaps what the Cave Supper Club is most remembered for is its variety of world class acts that have passed through its doors. The list of prestigious headliners included Johnny Cash, Ray Charles, Tony Bennett, Louis Armstrong, Fats Domino, Ella Fitzgerald, Bette Middler, Ike and Tina Turner, Liza Minelli, and even James Brown. These are just a few of the countless acts and bands that performed in the iconic Vancouver club. A more complete list of performers can be found at http://pnwbands.com/cave.html .Vancouver’s hospitality was the major booking factor that artists took into consideration when planning tours, and soon the Cave was a venue in high demand by world class acts. Vancouver was booking acts that were now comparable with the stages of Las Vegas, and was pushing our city to a cultural hub. The Cave also supported many local musicians, housing a massive house band lead by saxophonist Fraser McPherson. The club (although popular all through the late 30’s and 40’s) peaked in popularity in the 1950’s and represents an era where Vancouver’s social nightlife was on track to being comparable with other major hubs such as New York and Vegas. This was largely due to the Post War movement, and shift in social norms and standards. Sadly the rest of Vancouver did not support the club’s liberal party going outlooks, and booking major acts fell on hard times in the 1970’s. Even the dancers and adult entertainers were becoming harder to find, and many were exporting their services outside of the province. The club was not bringing in the attention it had use to, and the dreams of early innovators such as Isy Walters of making Vancouver the new Vegas had never come to fruition. The Cave Supper Club closed in 1981 and was demolished years later. Today the spot of the original club (located at 626 Hornby Street) is the site of a parking garage and TD bank. No commemorations of the club can be found in the area, and memories of the swinging supper club are quickly dissipating from Vancouverites minds. The Chuck Davis History of Metropolitan Vancouver by Chuck Davis. 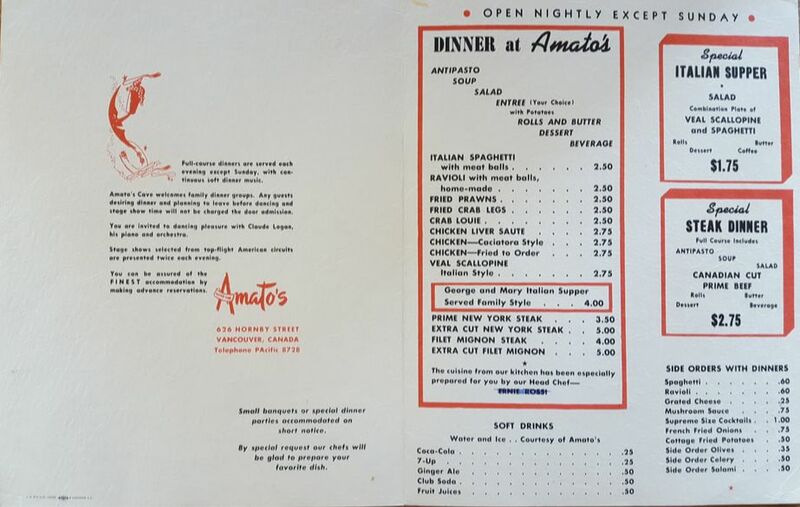 A menu from Amato's Cave Supper Club, April 1952. Courtesy Diana Graham.